Although modern in its architectural vocabulary, this custom home project makes reference to the workman style housing present in the neighborhood and uses this a basis for the design. Humble in its presence on the street the front elevation features a monolithic brick volume which is offset by a protruding fibre-cement block. These contrasting elements act as an analogy of old versus new and speaks to the rejuvenation currently underway in the area. Inside the house boasts a beautiful open living, dining and kitchen area which is bathed in daylight. 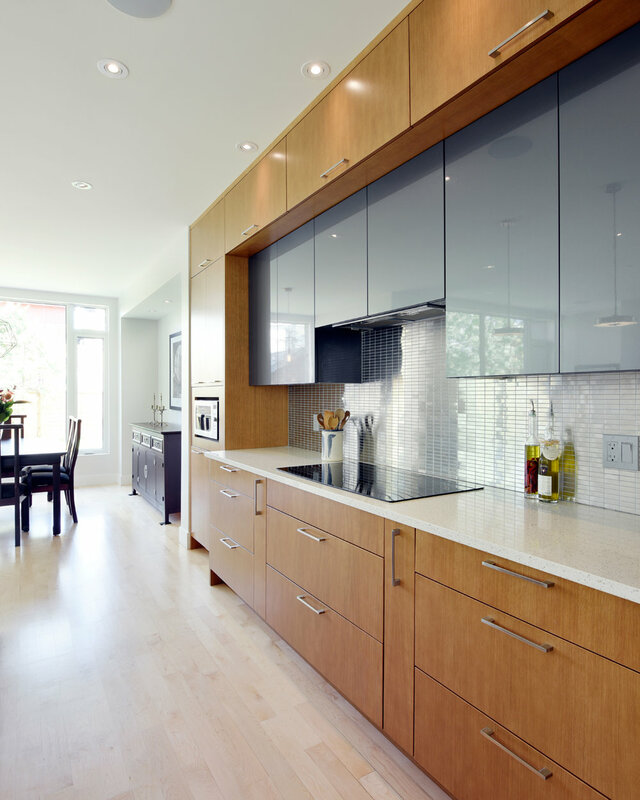 The kitchen features a stunning island which becomes the focal point of the main interior space. The dining room projects towards the back of the house to which creates an implied sense of intimacy. With large corner windows offering unobstructed views of the rear yard the dining room also gives the impression that you are dining in a park. What this house lacks in size it makes up for in efficient design. The flat roof allows the house to have generous ceiling heights without having a heavy presence on the street. The use of brick refers back to some of the original housing stock of the area, while the fibre-cement volumes protrude and hang off the building offering a distinctly modern aesthetic. Sympathetic to its surroundings and refined in its articulation, this project serves as an excellent example of modern infill development.